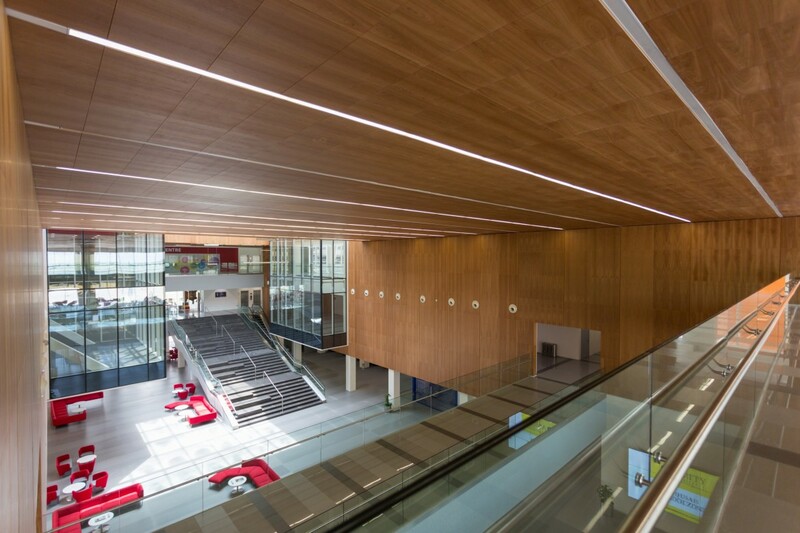 Hunter Douglas Architectural has launched an innovative range of wooden ceiling and wall systems with nano- perforations that provide excellent acoustics without compromising on the aesthetic quality. The wood veneer panels contain countless microscopic perforations, which at 0.5mm diameter are hardly visible to the naked eye and have superior absorptions qualities. Chris Wielenga, Business Manager Wood at Hunter Douglas Architectural, said: “The nano-perforations in the wood veneer are so tiny that they are invisible to the naked eye from only a short distance, unlike the usual perforations that have a larger diameter of around 5-10mm. The nano-perforated panels have been developed by Hunter Douglas Architectural in response to growing demands from architects for wall and ceiling solutions that are both aesthetically pleasing and acoustically effective. The nano-perforated acoustic panels comprise fire-retardant 16mm MDF, a black acoustic membrane and a top layer of 0.5mm wood veneer. Microscopic perforations with a diameter of 0.5mm are punched into the top layer, while the MDF receives larger perforations up to 12mm in diameter. The punching method differs from commonly employed perforation techniques, too. 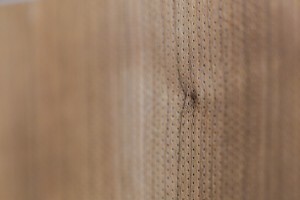 The usual method is to create perforations using needles, but the displaced wood tends to move back, which affects absorption. Punching removes the wood completely. The new wall and ceiling panels are available in more than 40 types of wood veneer and they are available in various standard sizes (600mm x 600mm, 1200mm x 600mm, 1800mm x 600mm, with a maximum length of 2780mm for wall panels) or in custom sizes on request. A range of finishes, in addition to the standard UV lacquer, includes various levels of glossiness and a pigmented finish such as whitewash, while the panel joints can be covered, semi-covered or open. The nano-perforated panels are fire retardant – B-s2, d0 according to EN 13501-1- and sustainable. High-grade veneer is produced from the best part of the tree trunk and is used sparingly. The panels can also be recycled, providing raw materials for new panels. Ceiling panels are mounted in a T-24 grid, while wall panels are attached to a frame with special clips. All systems offer full access to the plenum after installation, as the panels can be individually removed.